rely on for all of your swimming pool needs. Let K&H Pools help you select pool decking that coordinates with your home and enhances the beauty of your swimming pool. Contact Us. 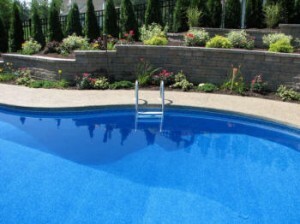 K&H Pools has a wide selection of swimming pool vinyl liner designs to choose from. Choose a solid safety cover with drain panels or a SunGuard mesh that will block 99% sunlight while still allowing water from rain and snow to drain through freely giving you superior protection in the winter months. You’ve had a wonderful summer making lifetime memories for you and your family, but now it is time to close your in-ground swimming pool. Let K&H Pools close your swimming pool for you to ensure that your closing is done correctly and that winter freezing won’t damage your pool. Ask about our referral incentives.